A company’s sales and marketing teams often have a complex, sometimes contentious, relationship. On one hand, both sides realize that they need to work together in order to meet their demand and revenue goals. On the other hand, many sales and marketing teams barely speak to one another – never mind working together. 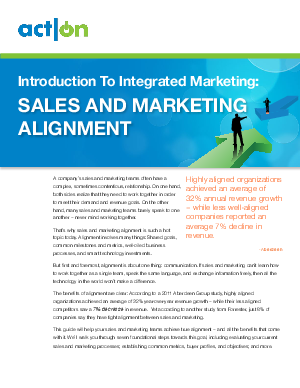 This guide will help your sales and marketing teams achieve true alignment - and all the benefits that come with it. We'll walk you through seven foundational steps towards this goal, including evaluating your current sales and marketing processes; establishing common metrics, buyer profiles, and objectives; and more.